In his TED Talk, Simon Sinek used the theory of diffusion of innovation to explain how mass market success or acceptance can be reached. Diffusion of innovations is a theory that seeks to explain how, why, and at what rate new ideas and technology spread through cultures. Everett Rogers, a professor of communication studies, popularized the theory in his book Diffusion of Innovations; the book was first published in 1962, and is now in its fifth edition (2003). In his Ted Talk, Simon Sinek explains that if you want to have mass market success or acceptance of an idea you cannot have it until you achieve this tipping point between 15 and 18% and then the system tips. You have to cross this gap between the line that includes the first 2 categories and this tipping point (the chasm). The early majority will not try something until someone else has done it. The first two categories are more proned to act on their gut decision and to act on what they believe. In his book Crossing the Chasm, Geoffrey Moore argues there is a chasm between the early adopters of the product (the technology enthusiasts and visionaries) and the early majority (the pragmatists). 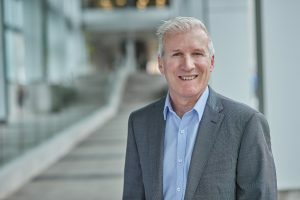 Moore believes visionaries and pragmatists have very different expectations, and he attempts to explore those differences and suggest techniques to successfully cross the “chasm,” including choosing a target market, understanding the whole product concept, positioning the product, building a marketing strategy, choosing the most appropriate distribution channel and pricing. The most difficult step is making the transition between visionaries (early adopters) and pragmatists (early majority). This is the chasm that he refers to. Moore’s theories are only applicable for disruptive or discontinuous innovations (those who force a significant change of behavior by the customer). Isn’t it what coaching does? Pragmatist (early majority) in pain are the people who will move first. They are not in exploration mode, they are in desperation mode. Who really has to act now? This makes a lot of sense because most people change their lives only after a tragedy! After some reflection, I could see many parallels with the profession of Coaching. I believe that we can use the theory of Diffusion of innovation and crossing the chasm to try to assess how far we are from mass market acceptance. Here are some reasons why I think we could use these theories to assess the state of Coaching. Even though Coaching has been existing for more than 20 years, it is still in its infancy and it is still evolving. According to the ICF 2012 Global Coaching Study, approximately 47,500 professional coaches are now in business worldwide (bringing cumulative annual revenue close to $2 billion) as compared to 2,100 professional coaches in 1999. The membership of the ICF was 22701 in 2013 (source 2013 ICF annual report). This makes it a very small profession compared to other professions at this time in history. Coaching is indeed disruptive and it forces significant change of behaviour by the customer. It has not reached mainstream yet. Therefore, for all these reasons, I believe that Coaching is still an innovation/new idea despite more than 20 years of existence. It has not yet reached the masses which means that the majority of people don’t know what coaching is and what are the benefits of it. According to the 2014 ICF global Consumer Awareness Study, 17% of the global population is very aware about coaching, 41% is somewhat aware, and 42% is not aware (p8 of the report). 17% are very aware and have been in a coaching relationship. Those respondents who had not to date participated in a coaching relationship were asked to indicate if they would consider participating in a professional Business and/or Life Coaching relationship. 33% of the 2nd unaware (19%) and 3rd aware (47%) group said they would consider a coaching relationship. The tipping point is between 15 and 18% according to Simon Synek. 17% of the population are very aware and have been in a coaching relationship (2014 ICF global Consumer Awareness Study. 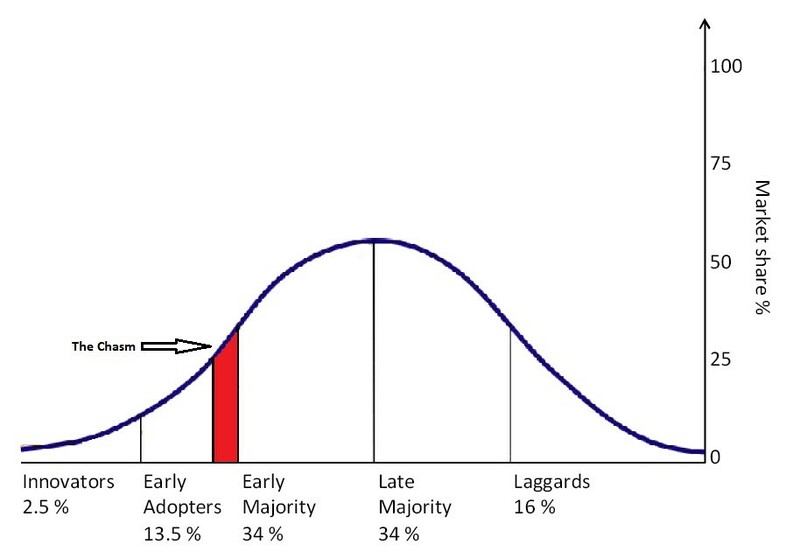 The innovators (2.5%) and Early Adopters (13.5%) composes 16% of the population (theory of diffusion of innovation). The most difficult step is making the transition between visionaries (early adopters) and pragmatists (early majority). This is the chasm (Crossing the chasm Geoffrey Moore). Pragmatist (early majority) in pain are the people who will move first. They are not in exploration mode, they are in desperation mode. Who really has to act now? (Crossing the chasm Geoffrey Moore). The 17% of the population that is aware and have been in a Coaching relationship is probably mostly composed of the Innovators and Early adopters and a few from the other categories. 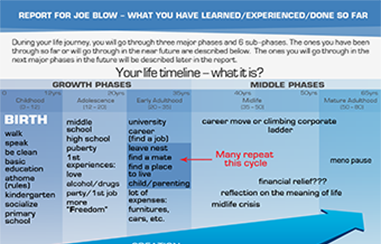 If 17% of the population are very aware and have been in a coaching relationship, we should be very close to the tipping point and to mass market acceptance. However, maybe the tipping point in the cases of human evolution thinking or awareness, is higher than in the theory of diffusion of innovation. As we have seen before, our profession seems to be in the tipping point zone which would trigger mass market acceptance. Proven through research by the likes of the Institute of Coaching at McClean Medical School Harvard affiliate. Established by the ICF (international Coaching Federation) through individual credentialing and program accreditation. Established through summits such as the WBECS (World Business & Executive Coach Summit) The WBECS group has a strong focus on increasing ethics and standards in the industry as this leads to improved results for the client, the coach and the brand of the coaching industry as a whole. Coaching is now thought in many universities such as Columbia University and Georgetown University, and many others around the world. Many Celebrity coaches, like Tony Robbins, Marshall Goldsmith and others promote the profession of coaching through their work. Many of the most powerful and influential people in the world are using coaching. It is widely used by CEO’s and executives of major companies in the world and it is promoted by such great minds as Bill Gates the richest mind on the planet and Eric Schmidt Google’s CEO. We seem very close to Mass market acceptance, so what is missing? Now let’s look at what the coaching community vision is for the future. Coaching is certainly a profession which can contribute very significantly to a better world and when we will reach mass market acceptance we could see a major shift in humanity! This is my greatest hope! In fact, all Coaches are so convinced that they we have found a great way to improve human life, that they have changed careers, they have invested thousands of $$$ and time in their development and they have shifted their lives and are dedicated to change human lives. I think that the coaching community through the ICF and the likes of CTI (Coaches Training Institute) is striving toward that goal of reaching mass market acceptance. Core Purpose: Lead global advancement of the coaching profession. Envisioned Future-Big Audacious Goal: Elevate coaching to an integral part of society, with ICF Members representing the highest-quality professional coaches. The International Coach Federation is committed to enhancing global awareness of professional coaching and of ICF. In their vision story, The Coaches Training Institute CTI, one of the biggest Coaching school in the world, is hoping to transform 50 million lives by 2023. As we can see, these examples of big audacious goals could have a major impact on humanity. In light of the vision and work being done through organizations or events we can assume that we will eventually reach mass market acceptance but since we are an innovative profession and we like to generate disruptive and positive changes in people’s lives and in the world, I am calling on you coaches for your ideas by asking you what else? How can we reach the tipping point? How can we cross the chasm? I would be glad to hear your ideas and then I could put them all together and come back to you with a summary. I hope to generate a discussion that will move us forward on our quest to change the world!